My name is Art F. and I welcome you to my site. The purpose of which is to provide some information for folks in recovery. The effectiveness of this site will depend on the dialogue and input I receive from others. There is a wonderful cross section of professional, academic and ordinary folks like me in the fellowship of Alcoholics Anonymous. Once we walk in the meeting door we are all the same. It doesn't matter if you are sober 30 years or brand spanking new we all have the common denominator, "We are POWERLESS over alcohol.. 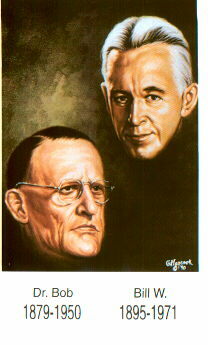 Thank God Almighty for the co-founders of this fellowship, Dr. Bob and Bill W. and oh yes, the gentleman and good friend of Bill W. who first carried the message,, Ebby. This site is not sanctioned by Alcoholics Anonymous in any way. It is just a humble way of expressing my Love of the Fellowship and the Program of Alcoholics Anonymous and if this site aids a shutin or someone who otherwise might not have considered the program, I am blessed.